Since 1950, Don McNea Fire School has prepared over 60,000 applicants for entry-level and promotional exams across the country. Don McNea Fire School’s Fire Department In-Basket Exam Preparation has been put together by Fire Chiefs who are nationally-recognized authors and who have been assessors for hundreds of fire promotional Assessment Centers. Don McNea Fire School’s Fire Department In-Basket Exam Preparation has been put together by Fire Chiefs who are nationally-recognized authors and who have been assessors for hundreds of fire promotional Assessment Centers. 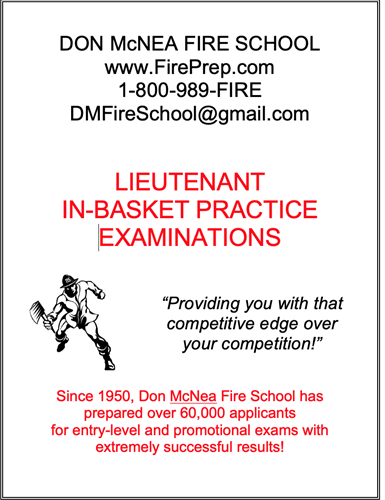 Our Fire Officer In-basket Examination Preparation package is the most detailed, comprehensive, to-the-point in-basket prep available. We back up that statement with our money-back guarantee – if you are not completely satisfied, we will refund 100% of the product cost – no questions asked. How can we give such a guarantee? Simple! Our In-basket Exam Prep package is very detailed and in-depth and has successfully worked for hundreds of promotional candidates across the country. Many of you are spending between $300-$400 on your reference material yet putting minimal time and investment into the Assessment Center portion of your exam, which is typically worth over 50% of your score. The Assessment Center is where the ballgame will be won! Your investment in these practice examinations could mean the difference between you getting promoted and not. Don’t go into a Fire Officer In-Basket Examination unprepared.